While most people would say “yes, these things should be true about nonprofit boards and leadership,” in practice many boards and management teams lack sufficient training and understanding to know how an organization embody these principles and apply these standards in their day to day operations. 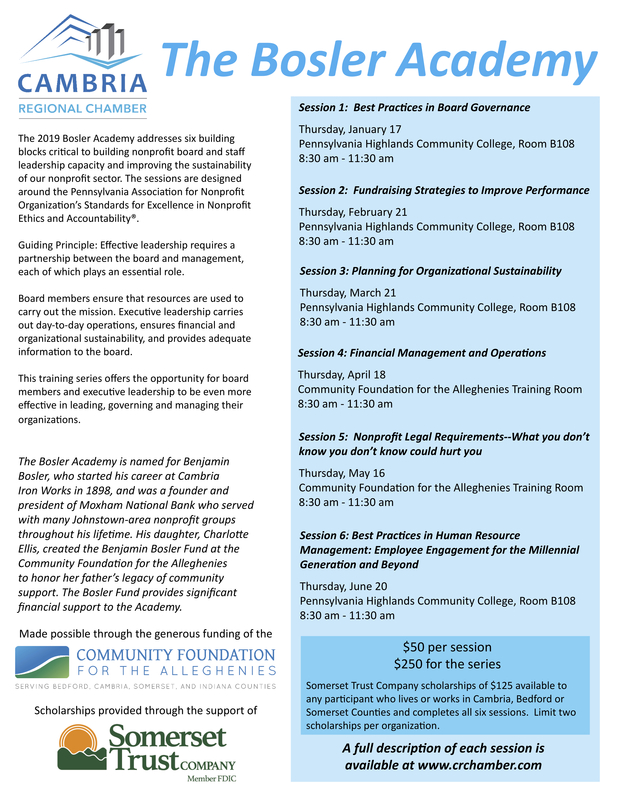 This training series offers the opportunity for board members and executive leadership of regional nonprofits to learn more about how to better lead, govern and manage their organizations. This program is designed as a two-part, 3-hour program, where board and staff members are encouraged to attend the first 90 minutes together, followed by an additional 90-minute segment for staff on how to better support the board. Truly effective partnerships require a clear definition of the distinctive roles of the partners and the boundaries between them. In the board/staff partnership, a proper division of labor is essential. The violation of the boundaries will, over time, erode the trust, mutual support and good communications that are essential for any partnership to succeed. Many board members were taught to be board members by the last board they served on and often lack an understanding of how the board/staff relationship should be managed. Many executive directors are reluctant to provide appropriate guidance to the board, fearing they are overstepping their bounds. 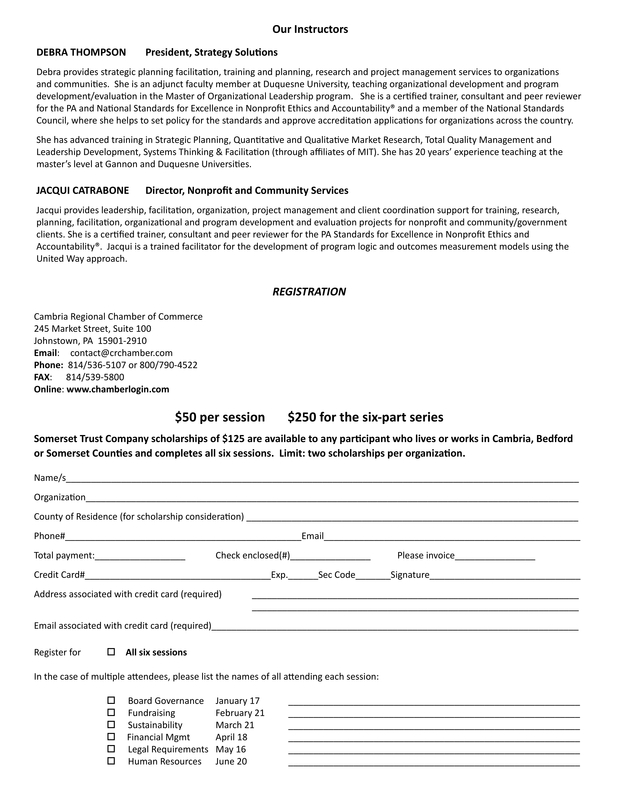 This workshop is highly interactive and explores “whose job is it?” regarding the various components of the board/staff relationship in supporting the various aspects of leading and running a nonprofit, and sets the stage for a practical, candid discussion regarding role clarification for a nonprofit organization. This workshop also covers the role(s) of the board in governance, fundraising, management service volunteerism and direct service volunteerism. This helps board and staff members recognize which “hat” they are wearing, and how to work together more effectively. The role of the Executive Director and staff in supporting the board is often vague and ill-defined. This creates ambiguity in how the board and its committees are managed, often resulting in dis-engaged and ineffective board members. Using the completed staff work* principle of management, participants are taught the specific activities that the Executive Director (or designated staff member) would do to support the board overall as well as specific individual committees such as Executive, Governance, Finance, Program, Development, Audit/Compliance and other. * completed staff work is a management principle which states that subordinates are responsible for submitting written recommendations to superiors in such a manner that the superior need do nothing further in the process than review the submitted document and indicate approval or disapproval. Everyone wants to raise more money, don’t we? While this is true, many nonprofits struggle to increase their fundraising year after year. Many nonprofit organizations want to add planned giving or major gifts to their fundraising portfolio, but never seem to get the effort off the ground. This workshop gives the participants tools to more effectively evaluate the “return on investment” from your fundraising efforts and to think strategically about what your organization needs to do to “take it to the next level” and really thrive, not just survive. The session also includes an overview of the Standards for Excellence® related to the fundraising function. At the beginning of the session, participants are polled using OptionPower audience response system to determine their backgrounds, experiences, expertise and knowledge of the topics presented. This allows tailoring of specific remarks, providing highly targeted information that meets attendees’ interests, and yields opportunities to encourage idea/expertise sharing among audience members. The presentation includes techniques to evaluate fundraising efforts and tools that can be used to focus energies on the “most productive” strategies that produce the greatest “return on investment.” The presenter(s) will describe the “critical success factors” that are required to develop and implement “new fundraising models,” whether you are seeking to implement a planned giving or major gifts program or want to implement other strategies that will enhance overall fundraising outcomes. For many people in the nonprofit sector, “sustainability” simply means raising the money you need to meet your mission and deliver your programs and services. For others, sustainability focuses mainly on determining the right strategy for continuing to offer a program or service once the seed funding has been exhausted. While this specific interpretation may be the initial reaction, experts encourage nonprofit professionals and leaders to think more broadly about the meaning of sustainability. As Webster’s definition suggests, the challenge in sustaining our organizations stretches from basic subsistence and maintenance (keeping it alive – surviving) to leading the organization to continue to grow, redefine itself in changing times, and be ready to respond to emerging community needs (keeping it relevant – thriving). This workshop will provide an overview of nonprofit best practices from The Standards for Excellence® with a specific focus on Finance and Operations. Nonprofits should have sound financial and operational systems in place and should ensure that accurate records are kept. The organization’s financial and non-financial resources must be used in furtherance of tax-exempt purposes. Organizations should conduct periodic reviews to address accuracy and transparency of financial and operational reporting, and safeguards to protect the integrity of the reporting systems. This workshop will provide an overview to the Standards for Excellence® with a specific focus on Legal Compliance and Ethics. Whether your organization is small or large, nonprofits enjoy the public’s trust, and therefore must comply with a diverse array of legal and regulatory requirements. Organizations should conduct periodic reviews to address regulatory and fiduciary concerns. One of the leadership’s fundamental responsibilities is to ensure that the organization governs and operates in an ethical and legal manner. Fostering exemplary conduct is one of the most effective means of developing internal and external trust as well as preventing misconduct. Moreover, to honor the trust that the public has given them, nonprofits have an obligation to go beyond legal requirements and embrace the highest ethical practices. Nonprofit board, staff, and volunteers must act in the best interest of the organization, rather than in furtherance of personal interests or the interests of third parties. A nonprofit should have policies in place, and should routinely and systematically implement those policies, to prevent actual, or perceived conflicts of interest. Ethics and compliance reinforce each other. Debra Thompson and Strategy Solutions have worked with over 100 organizations throughout the region, including numerous strategic plans for hospitals, post-acute health care organizations across the continuum of care, as well as nonprofit, behavioral health and social service agencies. As a certified WBE in Pennsylvania, with a mission to create healthy communities, Strategy Solutions has facilitated transformation in organizations and communities by engaging stakeholders through effective outreach, inquiry, and data collection and effectively summarizing data to draw conclusions. We facilitate adoption of best practices in organizations through a do-teach-coach model and offer training and support for those who wish to ‘do it themselves.” We create a commitment to action through consensus building by identifying specific human, capital and operating resources required to achieve tangible outcomes and assessing the capacity and capability of individuals and teams to accomplish assigned objectives. We also identify technical competency gaps to ensure implementation. Deb will be the primary trainer. Debra Thompson is President of Strategy Solutions. In this position, she provides strategic planning facilitation, training and planning, research and project management services to organizations and communities. Debra is also an adjunct faculty member at Duquesne University where she teaches organizational development and program development/evaluation in the Master of Organizational Leadership program. She was also an adjunct professor at Gannon University for 10 years where she taught Strategic Planning, Research Methods and Program Development. She is a certified trainer, consultant and peer reviewer for both the PA and National Standards for Excellence in Nonprofit Ethics and Accountability® and a member of the National Standards Council, where she helps to set policy for the standards and approve accreditation applications for organizations across the country. Deb received her Master of Business Administration from Gannon University. She has also completed advanced training in Strategic Planning, Quantitative and Qualitative Market Research, Total Quality Management and Leadership Development, Systems Thinking & Facilitation (through affiliates of MIT). She has 20 years’ experience teaching at the Master’s Level at Gannon and Duquesne Universities. As Director, Nonprofit and Community Services, Jacqui is responsible for providing leadership, facilitation, organization, project management and client coordination support for training, research, planning, facilitation, organizational and program development and evaluation projects for nonprofit and community/government clients. She is a certified trainer, consultant and peer reviewer for the PA Standards for Excellence in Nonprofit Ethics and Accountability®. With an undergraduate degree in Psychology from the Pennsylvania State University and a Master of Social Work degree from Edinboro University of Pennsylvania, Jacqui brings a depth and breadth of project management and program development experience to SSI clients. Earlier in her career, Jacqui was a Research Project Manager at SSI where she was responsible for developing, implementing, analyzing and reporting primary and secondary research projects in all industry sectors and facilitating program development initiatives. Her significant accomplishments include the facilitation of the Northwest PA Regional Economic Development “Roles and Players” Analysis for the Northwest Commission, that resulted in better working relationships between the county-level economic development & planning agencies and the commission. She was also instrumental in the establishment of the Success by Six program in Erie County and work on the development of the program outcomes measurement and evaluation process for GECAC’s Even Start Program, which was recognized by the PA Department of Education as a best practice. Jacqui is a trained facilitator for the development of program logic and outcomes measurement models using the United Way approach.